Who among us didn’t feel a little bit weak at the knees at the prospect of a more interconnected Malaysia? 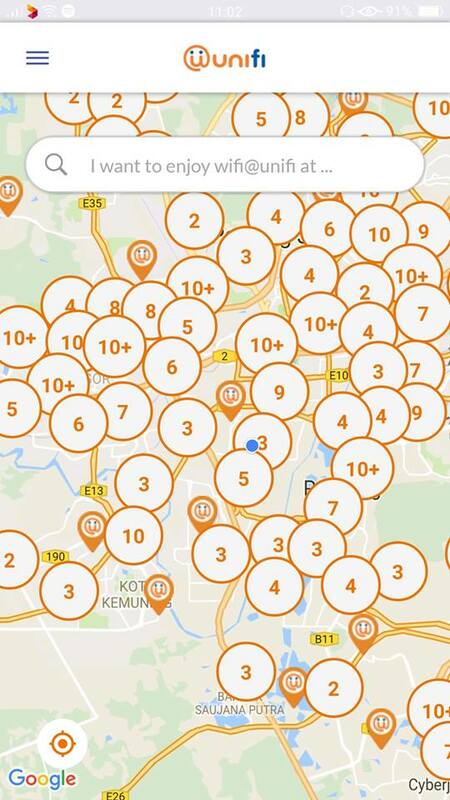 After all, it seems like a game changer for WiFi availability in Malaysia. 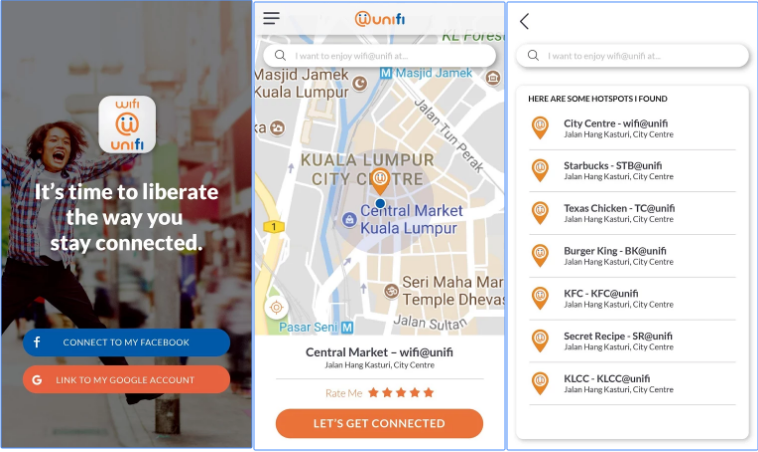 Open to all in Malaysia, whether Unifi subscribers or not, the i-foundit! app was launched to much fanfare on the 25th of September by our Prime Minister Najib Razak himself. With 5,800 WiFi points available to connect to nationwide, TM is even getting the ball rolling by offering free use up until 31st December 2017. After that, WiFi is only 10 cents an hour. Users should be able to enjoy up to 4 Mbps of internet connectivity using any of their WiFi hotspots. I booted my Google Play app today and downloaded i-foundit!, in a bid to try out the WiFi services offered. 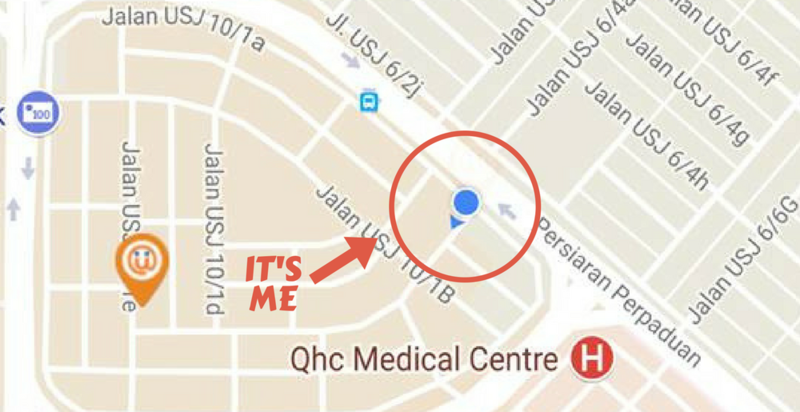 Hey, free is free, and I’m Malaysian. Too bad the two WiFi hotspots of walking distance from where I was didn’t work. The i-foundit! app is basically a WiFi discovery platform. Here’s what you’ll need to make this app work for you. When you boot up the app, it will prompt you to log into Facebook or Google Plus. Once this is done, the app will now show you a map with your location. The orange symbols around the blue dot (me), were all the WiFi hotspots supposedly available for me to connect to. 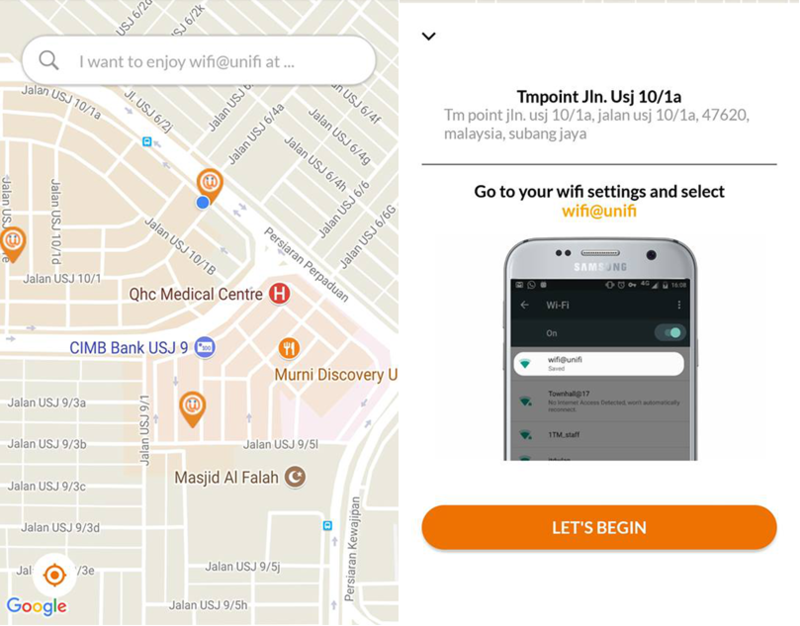 And once you choose which WiFi spot to connect to, (and have actually walked into WiFi range) the app will prompt you to enable WiFi, and connect to wifi@unifi the usual way. We’re not sure what happens after, which we’ll go into. If you wanted to, you could theoretically just walk around with your device until you see a wifi@unifi to connect to. You could also attempt to connect to the network on any WiFi-enabled device, even though the app is exclusively available on Google Play and iOS, because you don’t technically need the app for more than locating hotspots. But the app is, of course, an elegant solution—that is, if the WiFi actually worked. Based on my location, there were two WiFi spots at a lazy-man’s walking distance, so I headed towards the closest one. Maybe Skyrim didn’t build my map-reading skills enough, because while the app was accurately able to chart where I was as I walked, I could never quite find the store that supposedly held the WiFi hotspot I was seeking. So I tried standing at where I thought the WiFi hotspot would be (though never close enough apparently), and enabled my WiFi to look for the connection. There was nary a wifi@unifi to be seen. A little frustrated, I was still determined to test out this newly launched WiFi service, so, I tried walking to the slightly further WiFi hotspot, which was located near a large bank chain. It should be noted at this point that if I temporarily disabled the app to look at, say messages, and went back into it, I’d have to relogin through Facebook every time. It got a bit tedious, and I can imagine those with slow data who would actually be hunting down WiFi hotspots would be a little frustrated by this, as it would slow their phone down. Furthermore, I did find myself being a little confused. The app that was supposed to give me internet still requires internet for it to work. Counterproductive, no? And just to add insult to injury, the app’s interface glitched every now and again, especially when it came to loading the locations. I don’t think this was meant to happen. This time, I was able to position myself right in the middle of the orange marker, and booted up my WiFi listings. The blue dot is me, the orange pop-ups are the wifi hotspots. I even tried walking around back and forth to see if it would appear, but I never was able to find that elusive connection between my phone, and wifi@unifi before I gave up and made my way back. While my quest ended there, my discoveries were only just beginning. 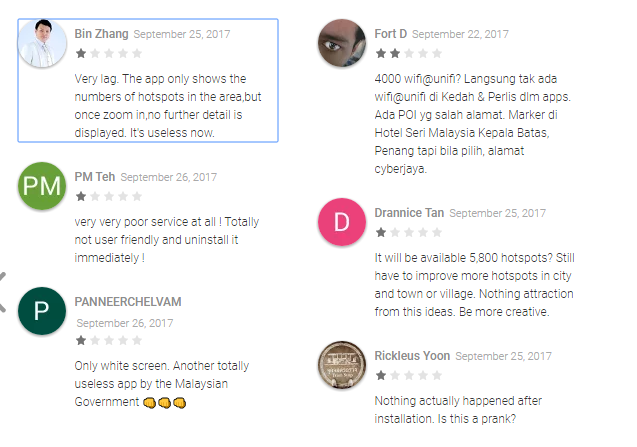 Apparently, I was not the only one excited to try out this new service, because there is quite a stream of disappointed users on the reviews page. Google Play reviews of i-foundit! In fact, I was surprised to discover that I was actually one of the luckier ones when it came to using the app. 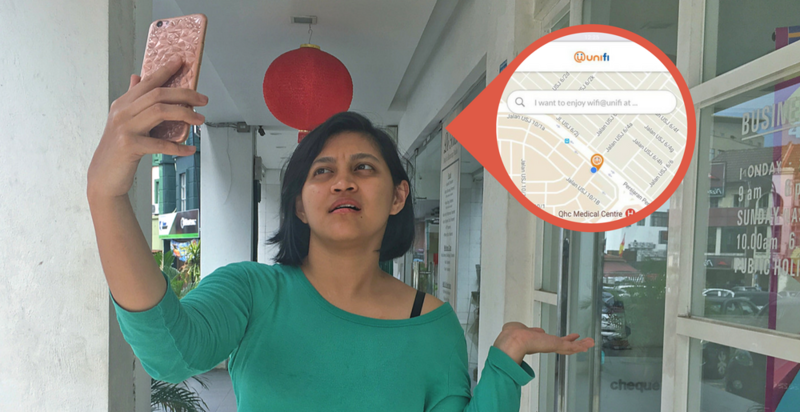 Some other reviewers couldn’t get the app to work at all, while others found that the real-time locator left a lot to be desired. I was also inclined to agree regarding the user-friendliness as it did take me a bit of fiddling to figure out how the app was meant to work. All in all, I still think that this is a great move by TM. I just also think that they could have done with at least 1 more month of testing and developing prior to launch. After all, this might just be growing pains. Perhaps the surge in interested users caused some of the newly installed equipment to malfunction. Or perhaps, some of the WiFi hotspots have yet to be activated. But I would also argue this: if you are going to launch something to as much fanfare as i-foundit!’s was, shouldn’t you also anticipate the surge in users post-launch? After all, many app developers would agree that having these types of issues during the beginning does not paint a pretty picture for this venture that would otherwise be so useful—if it worked. Android users, you can try your luck with the i-foundit! app here.